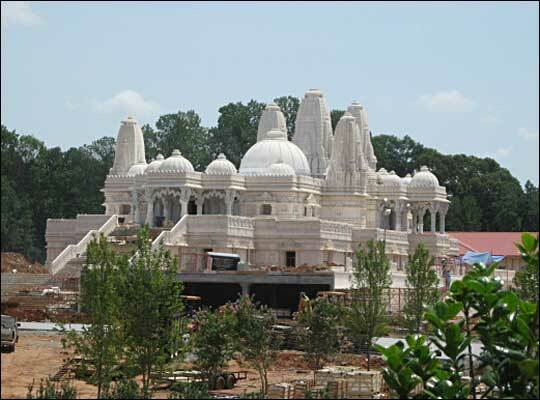 Gleaming Hindu Temple to Open in Atlanta Suburb After a year and a half of painstaking construction, one of the world's largest Hindu temples opens this month in Lilburn, an Atlanta suburb. Thousands of people from across the country are expected to come for its dedication. 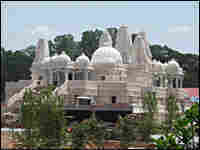 The Hindu temple, or mandir, in Lilburn, Ga., is a traditional structure made of stone and marble, constructed in 18 months. 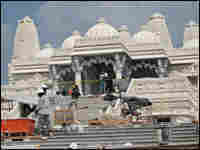 It will be dedicated by the spiritual leader, Pramukh Swami Maharaj, on Aug. 26, 2007. 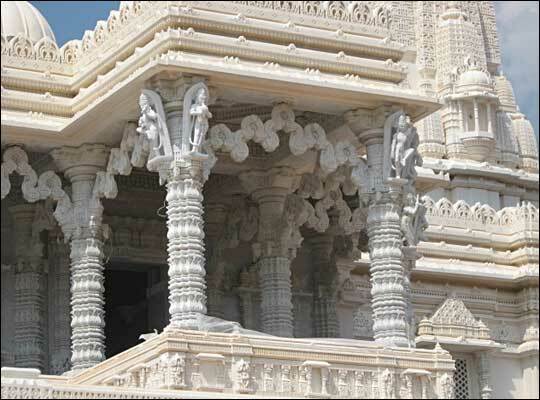 The outside of the temple is Turkish limestone. 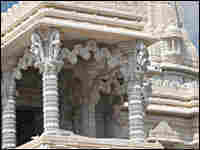 The interior and carved pillars are made of Italian marble, and the foundation is built from Indian pink sandstone, symbolizing that the culture and roots of the temple are in India. 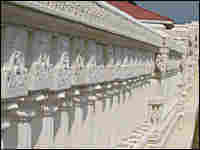 This close-up of the outside railings shows the detailed carving. 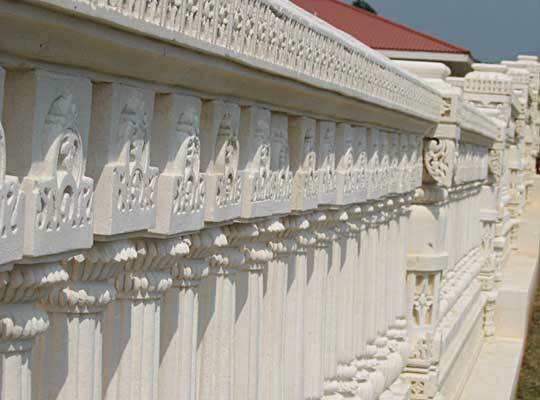 All of the stone was hand-carved in India and imported to the United States. Workers finish construction on the stairs and the entrance to the temple. When completed, it will be the largest in the United States. The city of Lilburn, Ga., looks like an ordinary Atlanta suburb. Modest homes give way to commercial plazas with a barber shop, a sporting goods store and a large supermarket chain. But down the road, rising out of a cloud of dust, is a spectacular vision — a gleaming white Hindu temple, one of the largest of its kind in the world. Made of Turkish limestone, Italian marble and Indian pink sandstone, the temple rises 72 feet into the sky and looks a bit like the Taj Mahal, with its soft white spires and 13 domes. The $19 million temple has been under construction for a year and a half, and this month it will be completed and dedicated in a ceremony expected to draw thousands of people from Georgia and across the U.S.
Lilburn is known for its good schools and affordable housing. Mayor Jack Bolton says that the Indian community approached the city about five years ago with plans to build the giant structure, a reflection of the city's changing demographics: The community is predominantly white, but the Hispanic and Indian populations are growing. "Lilburn has become a very diverse community, very international. As community leaders, we've embraced that diversity, and so we welcome it and see it as a very positive sign," Bolton says. The temple is an engineering marvel. No steel or metals have been used in the construction, and each piece, hand-carved and imported from India, was numbered, divided into sections and eventually set in place. The whole structure fits together like a giant jigsaw puzzle. 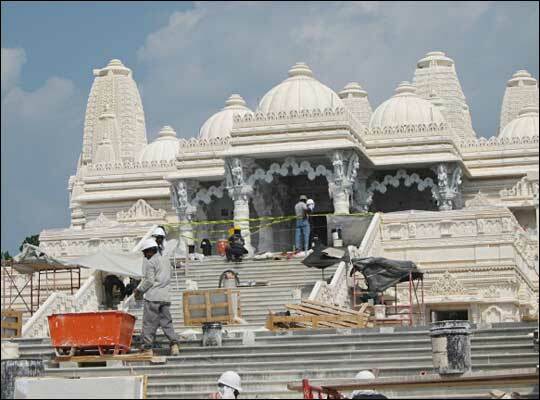 The effort to build the temple involved hundreds of volunteers, among them Manish Patel, who gave up his job as an engineer to work as the site manager, administrator and secretary. "When they come inside, we want them to feel the atmosphere," Patel says. "When they come out, they'll have some kind of message in their life." Ritesh Desai, a volunteer in Atlanta with the global Hindu organization BAPS, hopes the temple will draw together an increasingly diverse community. "Many of us have assimilated into the mainstream American culture. Yet the mainstream American culture does not know about India per se, or they might not have been to India. We're bringing a little bit of India to you," Desai says.